Short Sweet Synopsis: Alek is devastated when he learns his parents are forcing him to go to summer school to bump up his grades until he meets Ethan, skater boy extraordinaire. One Man Guy is a fun book that tells the story of Alek, a 14-year-old gentleman (he literally walks girls to the door! ), who is trying to find his identity. Yes he is Armenian, but he knows there is more to him than how his parents see him. When cool Ethan hijacks Alek into a forbidden day trip to New York, Alek discovers more than the secret to experiencing a day in New York with just $5. If you haven't figure this out from the cover and title, One Man Guy is about Alek falling for Ethan. If realizing you are gay isn't difficult enough, Alek must figure out what this means in relation to his traditional Armenian family. This is the first book I have read about Armenian Americans and I enjoyed the family dynamics. I think Michael Barakiva created a good balance with blending in Armenian culture without feeling like I was being lectured. The recipe for stuffed grape leaves at the end of the book was a great addition; after all, food was an important ingredient in the book (I just couldn't resist!). I really enjoyed reading One Man Guy. My minor complaint is that I wish we knew more about Ethan's family, but that is really just a personal preference. This is Alek's story, so It makes sense that the focus is on him and his family. I definitely recommend this book for anyone interested in first love, LGBTQ experiences, or a humorous book filled with family drama. 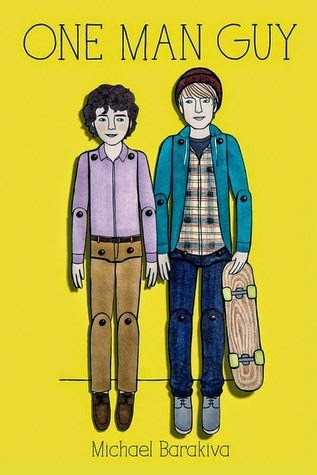 Short Sweet Synopsis: Two teens battling depression become unlikely friends after they stop each other from committing suicide. Finch's vivacious personality revitalizes Violet, but Finch starts to slip into a darkness of his own. Even though I had read great reviews of "All the Bright Places", I had my doubts. I mean a book claiming to be The Fault in Our Stars meets Eleanor and Park? Yeah right! Those are AMAZING books, there is no way "All the Bright Places" could come close to the brilliance in either book! While it didn't quite reach their level, I did love the book and the claim made sense to me. I was actually more torn up by "All the Bright Places" than "The Fault in Our Stars". I was totally crying on the bus during my morning commute and had trouble getting it together for work. "All the Bright Places" had me from the first page. It starts off with our two main characters, Finch and Violet, on the ledge of the bell tower at their school. It is clear that at least one of them, if not both, were about to commit suicide; however, I found myself laughing out loud at their exchange. I know that sounds completely twisted, but it is told through Finch's perspective and he is hilarious. Jennifer Niven gave him a strong voice and it carried me through the book. I did switch between the audio and print versions, so the narration by Kirby Heyborne probably played an immense role on my love for Finch. It has been a few weeks since I read the book and Finch is the character that has stuck with me. I'm not saying that I didn't cherish Violet as a character, but Finch was the vibrant force in the book. If you haven't deduced this already, "All the Bright Places" is about depression and how the characters deal with the issues in their lives. Finch tries to live everyday to the fullest and Violet has tried to cut herself off from the world. These two characters have amazing chemistry and just fit so well together. However you can't fix a person who isn't willing to get better and love does solve all your problems. I don't suffer from depression nor am I well versed in psychology, or anything related to the topic. 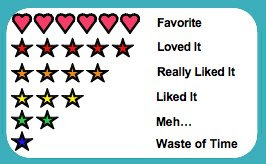 I can't speak to "All the Bright Places" accuracy on this level. What I can say is I found the book to be uplifting and heartbreaking. It was a roller coaster of emotions, and I'm not talking about in the kiddie section of the park, I'm talking about the you must be 5' tall to ride this sucker and if you have a heart condition, well good luck with that! Any book that can make me feel for the character that much will always have my vote. I'm trying to think about the things I didn't like about the book. I guess Finch's family didn't seem very realistic, especially towards the end. I can't go into much detail without giving away major spoilers, but they were just too detached from reality. Denial is one thing,but Finch's mom brought a whole new meaning to the word. This didn't ruin the enjoyment of the book for me though, it just felt a bit like a ploy to allow the story develop a certain way. 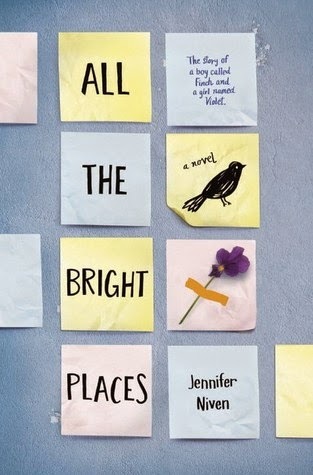 To state the obvious, I LOVED "All the Bright Places" even though it is early in year, I think it will be a standout title in 2015. This is a book I will definitely be thrusting into people's hands, whether or not I know them, and insisting they read. Seriously, READ IT!